Notes: Coppenhall was situated on the Grand Junction Railway (GJR) which opened from Newton to Birmingham on the 4 July 1837. The GJR was Britain’s first trunk railway and had been supported by many of the same individuals who had been behind the Liverpool & Manchester Railway (L&M). 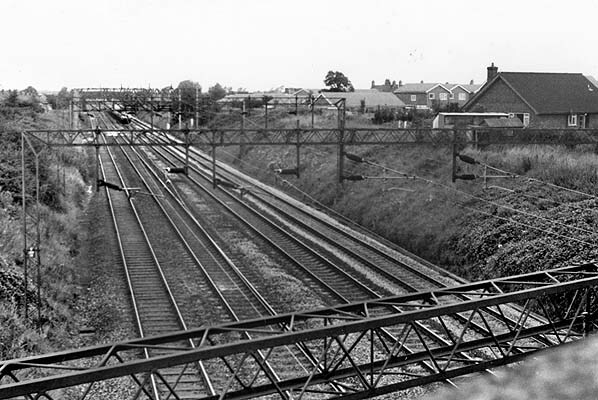 The GJR connected with the L&M at Newton Junction (which later became Earlestown Junction) thereby providing a link between Birmingham, Liverpool and Manchester. From 9 April 1838 the line connected with the London & Birmingham Railway (LBR) at Birmingham Curzon Street allowing passengers to travel between London, the Midlands and the great industrial and port cities of the north-west. Coppenhall station opened with the line on 4 July 1837. It was located on the south side of Bradfield Road/North Street which passed over the line on a bridge. Very little is known about the station which was probably nothing more than a simple cottage like structure. A building is shown on maps from the 1870s located on the up side of the line (Birmingham direction) on the south side of North Street that had probably housed the booking and waiting facilities. 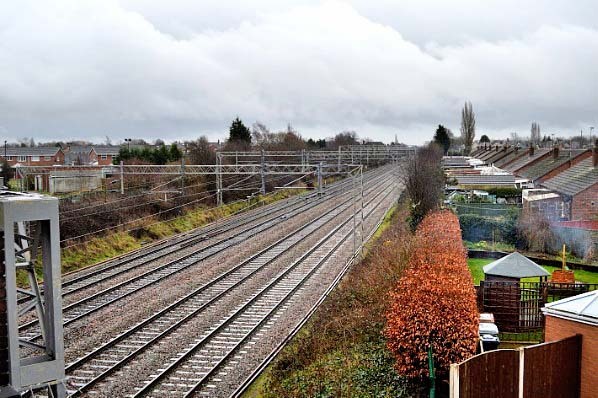 There would have been no raised platforms and to access to the down side (Liverpool/Manchester) passengers would have simply crossed the line. When the GJR opened there were two types of station, first class and halts. Coppenhall was the latter and was served by trains that conveyed first and second class passenger carraiges. Such trains were described as 'mixed' and at the time of opening Coppenhall had two in each direction Monday-to-Saturday. No trains called at Coppenhall on Sundays. Up trains ran to Birmingham Curzon Street and down services ran to both Liverpool and Manchester (the trains being split at Newton Junction). The GJR was a success but Coppenhall proved un-remunerative and it was closed on 10 September 1840. On 16 July 1846 the GJR became part of the London & North Western Railway. The railway running through the station went on to become part of the Anglo-Scottish West Coast Main Line. It was quadrupled through the site of Coppenhall in the first half of the 20th century and electrified in 1961. Route map by Alan Young. Looking south at the site of Coppenhall station in August 1978. The site of Coppenhall station shown on a six-inch OS map from 1875. There appears to be a building on the up side of the line that could have been the original station building. An 1876 1:2,000 scale map showing the site of Coppenhall station. By 1938 when this six-inch OS map was surveyed the line had been quadrupled obliterating all trace of Coppenhall station. The site of Coppenhall station looking south on 19 February 2015. 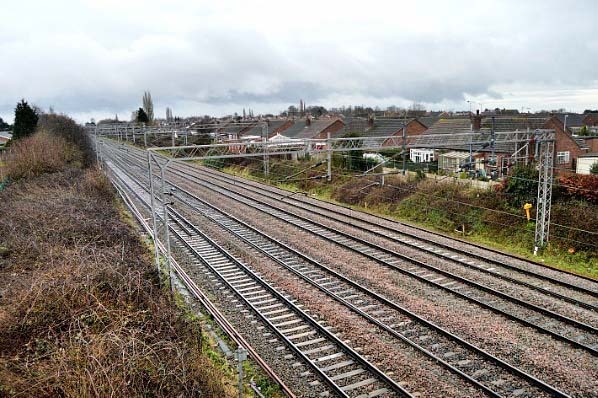 Looking south at the site of Coppenhall station on 19 February 2015.